The word Cyprus made up from the elements Carbon, Yttrium, Praseodymium, Uranium & Sulfur. 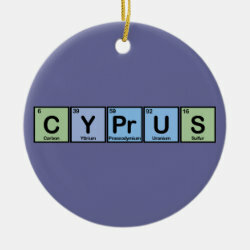 This is a fun and colorful design for Cypriots or anyone that loves Cyprus, especially if they also love chemistry or science! For fans of Cyprus and Cypriots too!